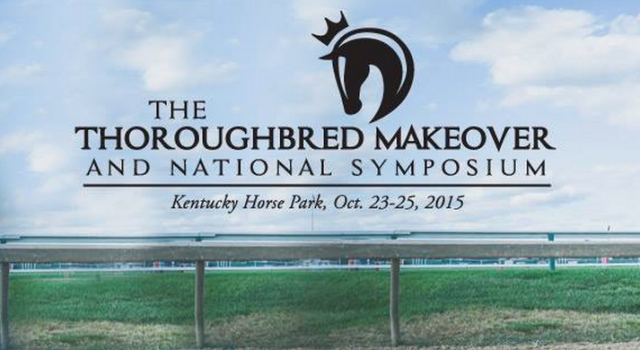 The countdown is on for the TCA Thoroughbred Makeover & National Symposium, which will be held Oct. 23-25 at the Kentucky Horse Park in Lexington. More than 200 off-track Thoroughbreds will compete in 10 different disciplines to showcase their suitability for second careers, and dozens of seminars, demonstrations and even a Thoroughbred Marketplace will keep OTTB enthusiasts busy all weekend. There’s plenty for eventing enthusiasts to be excited about, specifically. Nearly 50 riders and OTTBs will compete for the win in the eventing discipline test category, including 2014 Breeders Cup Distaff winning jockey Rosie Napravnik and professional eventers Laine Ashker, Lara Knight, Nick Larkin, Tik Maynard, Colleen Rutledge and Jane Sleeper (with Dorothy Crowell also competing in dressage!). Steuart Pittman, president of the Retired Racehorse Project, said this year’s Thoroughbred Makeover stands out in that it’s the first time the event has been open to trainers of all experience levels and backgrounds and not restricted to professionals, so there are also amateur and junior trainers competing in the 10 disciplines: barrel racing, competitive trail, dressage, eventing, field hunter, freestyle, polo, show hunter, show jumping and working ranch. “We have 200 horses coming. That makes it three days of a multi-ring horse show, which has never been done with all these different disciplines at one event. If you’re in the market for a horse, 85 of them are for sale. Plus there are 10 different seminars, a hell of a party and the launch of our magazine,” Steuart said. Especially for eventers in the market for an off-track Thoroughbred, the TCA Thoroughbred Makeover offers an excellent chance to see horses for sale that have already had some training since coming off the track. Eighteen of the Thoroughbreds competing in the eventing discipline test are for sale, with a total of 85 for sale across all 10 disciplines. The event program will designate which horses are for sale, and all sale horses are already listed in the Makeover Marketplace on RRP’s website. While Steuart said he doesn’t expect a large percentage of horses to sell on site at the event, it’s an excellent opportunity for shoppers to see 85 sales horses at one time. “Each horse will go through an arrival examination after shipping in to the venue, much like in-barns at an FEI competition. A vet will watch the horse jog for soundness and write down any observations about old injuries and blemishes. The seller can divulge information about the horse’s history and whether they have x-rays,” Steuart said. Potential buyers can also watch the horses compete. The eventing discipline test is using a format very similar to what the United States Eventing Association uses for its 4-Year-Old Young Event Horse Series. While the conformation portion of YEH will not be used, the Thoroughbreds will perform the 2011 USEA Young Event Horse Series Four-Year-Old Qualifying Dressage Test. Then the Thoroughbreds will jump a course designed by Cathy Weischhoff and built by Aaron Rust, with four show jumps immediately followed by six to eight cross country jumps. Riders will have the option of jumping fences at Beginner Novice or Novice height. After the final fence, each horse will demonstrate its gallop. “We like the Young Event Horse format because it’s a low-stress dressage test that’s not scored on each movement, while the jumping is low stress and judged. We removed the conformation section because we didn’t want to put too much weight on the look of the horse the trainers selected for the competition. Instead, we wanted to emphasize the training and talent,” Steuart said. During the TCA Makeover Finale on Sunday afternoon, the top three horses from each discipline will perform in front of the crowd, and the panel of judges for each discipline will pick the final winner. For eventing, the top three finalists will perform on the flat and over fences in front of the eventing judges: Lori Hoos, Linda Hauck, Caroline Walz, Julie Quattrocchi. The top five finishers in each discipline will receiving winnings from the $85,000 prize pot, and an additional $10,000 will go to the winner of the America’s Most Wanted Thoroughbred Contest. Each discipline winner will have two minutes at the end of the finale to make their case to Graham Motion, Dan Rosenberg and Erin Crady, all of whom are representing the event’s title sponsor, Thoroughbred Charities of America. This is where the crowd can really get into crowning the next America’s Most Wanted Thoroughbred, as Graham, Dan and Erin will factor the “applause meter” into choosing the winner. Last year’s America’s Most Wanted Thoroughbred winners Phillip Dutton and Icabad Crane will be on hand to give a demonstration and pass the crown to the new winner. Online voting is ongoing for the winner of the $5,000 Thoroughbred Ambassador Award, which is a trainer “who has most inspired in you an appreciation for the talent and trainability of the off-track Thoroughbred.” Olivia Dixon of the Kentucky Equine Humane Center is currently leading the voting, with upper-level eventer Laine Ashker in second place. You can click here to vote. The panel of judges will also select a Top Amateur Trainer and Top Junior Trainer during the finale, which each receiving $500. There’s going to be so much going on in the finale — and Steuart selected it as his own can’t miss event of the entire weekend — so be sure to plan to attend from noon to 5 p.m. on Sunday in the covered arena at the Kentucky Horse Park. Looking to the rest of the schedule, the eventing discipline test will be held 9 a.m.-4 p.m. Friday with dressage in Walnut Schooling Ring P, and jumping will be 10 a.m.-5 p.m. Friday in the the cross country paddock across from the Secretariat Center. There is so much more to see and do, with seminar speakers like Denny Emerson, Eric Dierks, Laine Ashker, Valerie Ashker, Tik Maynard, Bernie Traurig and David Hopper. General admission is free for the TCA Thoroughbred Makeover, Oct. 23-25 at the Kentucky Horse Park. Seminars cost $25. The Magazine Launch Party is $25, and the can’t miss Sunday finale is $15. Click here to purchase tickets, here to view the full schedule, and here to see the seminar list for the Thoroughbred Makeover.